Return to the main HABs Home Page. Also known as blue-green algae, but are not true algae. Naturally present in lakes and streams in low numbers. Can discolor the water or produce floating mats or "scums" on surface. Dissolved oxygen rises when algae or cyanobacteria are in the growth state and respiring, and decreases when algae continue to respire at night. During significant blooms, extreme depletion of oxygen may be detrimental to fish and other aquatic organisms. 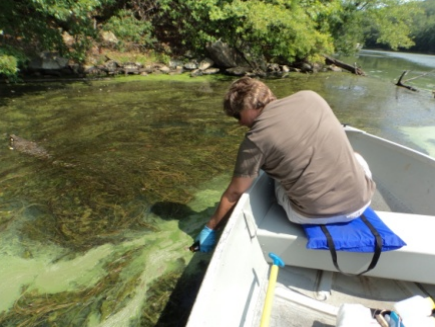 Cyanobacteria can produce toxins that are dangerous for humans, pets, livestock and wildlife. The toxins produced by the cyanobacteria are referred to as cyanotoxins. Cyanotoxins can be produced by a wide variety cyanobacteria. Degree of toxicity varies with species and concentrations. Microcystis: resemble a greenish, thick, paint-like (sometimes granular) material that accumulates along shores. Scums that dry on the shores of lakes may contain high concentrations of microcystin for several months, allowing toxins to dissolve in the water even when the cells are no longer alive or after a recently collapsed bloom. Anabaena: slimy blooms on the surface. Anabaena blooms may develop quickly and also resemble green or blue-green paint. Some species also form colonies, which are seen as large dark dots in water samples. Based on the surveys that have been carried out to date in U.S. waters, the most commonly identified cyanotoxins are microcystins, cylindrospermopsins, anatoxins and saxitoxins. Additional information on CyanoHABs, including other states' activities, is available on the EPA CyanoHABs website. 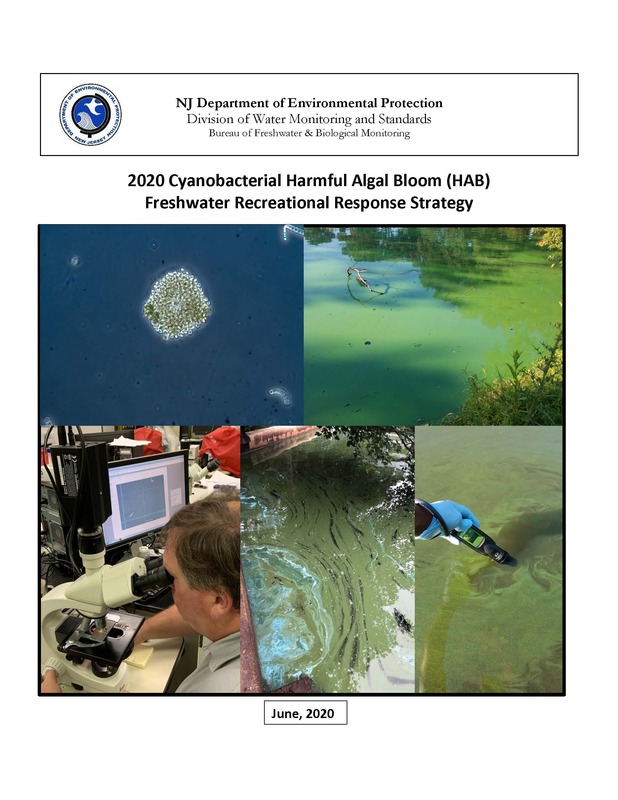 Information on how NJ handles cyanobacterial harmful algal blooms can be found in the Cyanobacterial Harmful Algal Blooms (HABs) Response Strategy document.